Every Saturday morning from 11am -12.30pm, during the French school term, a group of boys and girls from the ages of 6-15 get together to play rugby. The location of the lovely football field is U Mrazovky 1566 in Prague 5. It is right opposite the Le Lapin Bleu Restaurant and is not far away from the Andel Shopping Complex. It is only during school holiday breaks, in cases of very heavy rain or frost that no games are played. 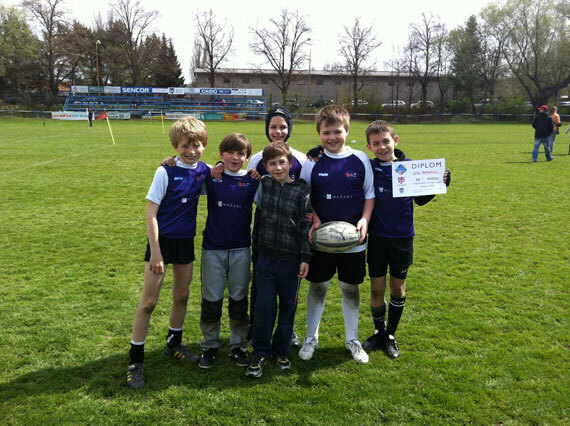 The mix of children who play kids’ rugby is very international and includes Czech, English, French and Dutch speakers. Everybody is welcome to join in the fun and register anytime by calling or emailing Andrew. His contact details can be found at the end of this article. If you have very young kids, who are not playing rugby yet, then you can safely let them or run around and play themselves at the sides of the field. The location is very peaceful and quiet as this field is located at the end of a one-way street. While the older kids train and play rugby, parents can sit and watch, meet other friendly parents or even read a book in their car (if they get too bored – something which is unlikely). So, why join? Well, apart from meeting new people and making friends both you and your kids get to spend some time outdoors and do something good for your bodies. This is always better than staying indoors. Rugby is an athletic, team sport and although it can be played indoors, is usually meant for outdoor play. It is a contact sport so children & parents should be aware that their children will be tackling and need a gum shield to protect their teeth. Robert, who is 10 years old has been playing on and off for the past 3 years and is now in the 9 -13 year-old group. Albert, 6, started playing about a year ago has been put into the 6 - 9 year-old group. A bunch of dedicated dads, with a great knowledge of and love for rugby train the children - generally bilingually in French and English. They do a fantastic job at keeping the kids interested, entertained and occupied during the 1 ½ hour long session. Most of the time is spent doing a variety of practice sessions and this always culminates in a real game being played at the end. Before every one goes home, the coaches usually gets all of the children together and gives them a rundown of their performance that day. They are always very encouraging to all the kids, which is a great way to make them want to come back! This is also the time when any outstanding business or announcements about upcoming training sessions etc are made. Finally, in each age group one player (boy or girl and always a different person each time), gets chosen as the ‘Player of the Week’, receives a trophy, and gets to keep it at home until the following week. 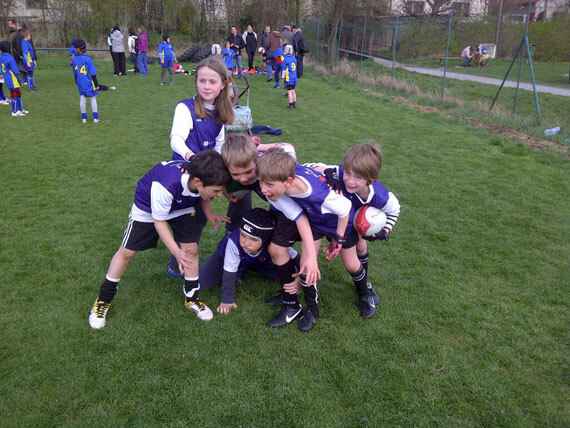 U9, U11 and U13 teams are also entered into Czech rugby tournaments every 2-3 months which are normally held on a Sunday morning and are instead of the usual Saturday sessions. So, if you would like your kids to get out into the fresh air and play some sport on Saturdays, then Kids’ Rugby on Saturdays is the way to go. Don’t be shy, Andrew would love to hear from you and absolutely everybody is welcome! Rugby union is a team sport which originated in England in the early 19th century. It is played with an oval-shaped ball on a field up to 100 meters long and 70 meters wide with H-shaped goal posts on each goal line. William Webb Ellis is often credited with the invention of running with the ball in hand in 1823 at Rugby School when he allegedly caught the ball while playing football and ran towards the opposition goal. Although the evidence to support the Ellis story is doubtful, it was immortalized at the school with a plaque unveiled in 1895. In 1848, the first rules were written by pupils. The Rugby World Cup, first held in 1987, takes place every four years, with the winner of the tournament receiving the Webb Ellis Cup. The Six Nations in Europe and the Tri Nations in the southern hemisphere are major international competitions held annually. Major domestic competitions include the Top 14 in France, the Aviva Premiership in England, the Currie Cup in South Africa, and the ITM Cup in New Zealand. Other transnational competitions include the Magners League, involving Irish, Scottish and Welsh teams (and Italian teams from 2010–11); Super Rugby (previously Super 12 and Super 14), involving South African, Australian and New Zealand teams; and the Heineken Cup, involving the top European teams from their respective domestic competitions. WHEN: Kids’ Rugby is held every Saturday morning from 11am - 12.30pm, during the school year except at times of heavy rain or frost. ADDRESS: Football field at the end of a one-way-street called U Mrazovky 1566, Prague 5 (opposite the Le Lapin Bleu Restaurant). DIRECTIONS: The closest Metro Station is the Yellow Line B - Andel. Plenty of free parking is available at the football field.